Last the week the Bee and I did some Easter egg dying. To make our eggs a little more interesting we used a rubber band resist method similar to the one you use when you tie-dye t-shirts. We started by filling several small plastic containers with warm water. Then added a tablespoon of white vinegar to each bowl. Next the Bee selected the colors she wanted and we added 10-20 drops of food coloring to the bowls, depending on the color and how dark it got. The Bee selected an egg, which I had already hard boiled earlier in the day, and plunked it into the the color dye she wanted. After the egg had sat a few minutes in the dye we took it out and dried it off a little. I then wrapped a rubber band around the egg. I did the rubber band wrapping part because you do need to be a little careful when wrapping the rubber band so you don't crack the shell. After I had wrapped the rubber bands around the egg, I gave it back to the Bee and she selected a different color to put the egg into. After a few minutes in a different color we took the eggs out dried them off and took off the rubber bands. 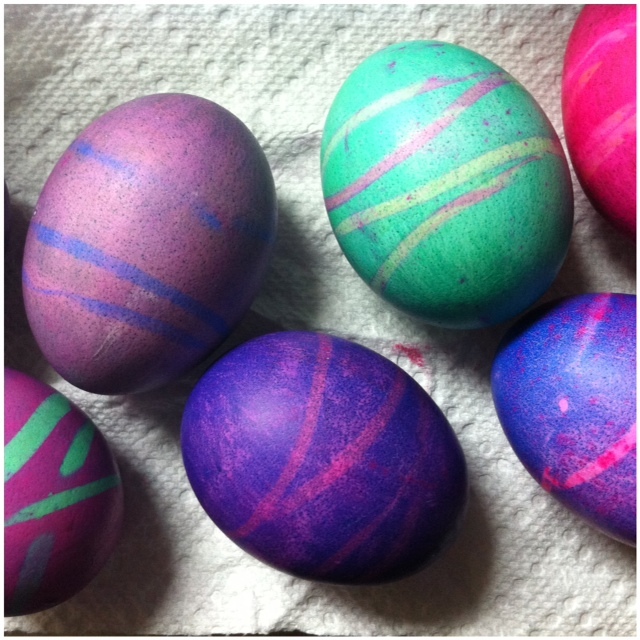 The rubber bands protected the egg from the second color dye creating beautiful stripes of color. The Bee was so excited when we pulled the first rubber band off and saw the striped of color, it's like magic she said! 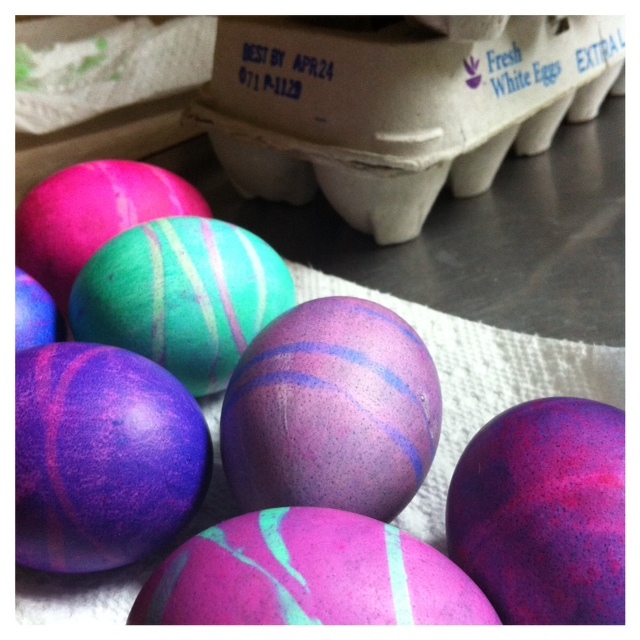 Your eggs turned out beautifully! We tried a few different methods (like tape and crayon resists), but turned out as nicely. Love this idea! Not as nicely, I meant! These eggs look beautiful! Love the stripes that rubber bands create. Thank you for linking to Kids Co-op and hope to see you again next week! I've never tried rubber band eggs before, but now I really want to! Yours turned out great. I’m doing an Easter link up today over on my blog…http://rustsunshine.blogspot.com. Would love it if you joined us! This looks like so much fun! I'm going to feature it on my Sharing Saturday post tonight at Preschool Powol Packets--congratulations! !